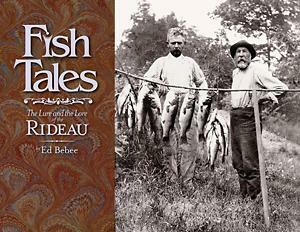 Fish Tales: The Lure and the Lore of the Rideau is a new book with sketches and rollicking stories of legendary fishing guides and nine Rideau Corridor communities, shaped to share a sense of the world as they knew it. Each “community chapter” is self-contained, but with links to the other chapters. A chapter starts with a quick sketch of the community to look at life and events – from the 1800s up to about 1960 in some cases. Guides talk about their experiences, other guides, their clients, and the realities of life. Game wardens and bait dealers aren’t forgotten. The guides’ hard-won local conservation and environmental knowledge is compared and contrasted with changing public attitudes and government policies. There is a list of some 500 guides, along with game wardens, tables of “Big Fish”, and lots of photos. “Fish Tales” makes it easy to explore and experience “the lure and the lore of the Rideau” by visiting the nine communities:- Delta, Battersea, Elgin-Morton-Jones Falls, Chaffey’s Lock, Newboro, Westport, Portland, Perth, Smiths Falls-Ottawa. For more information, please contact the author at: edward.bebee@sympatico.ca.